Update: Quantum Break PC is now available for all via the Windows 10 store and performance issues don’t seem to be widespread. If you want to play Quantum Break on PC, you can now, assuming you can afford the hefty £49.99 / $59.99 / €69.99 entry price. Early reports of framerate issues have dropped away, and while there’s no direct way to exit the game on the main menu, it can be done through moving your mouse to the top of the screen and waiting for a moment for a red x to appear, as with any Windows 10 app. It’s the first time one of these UWP games – Killer Instinct and Gears of War having come before – hasn’t had a main menu exit button, but it definitely isn’t required. 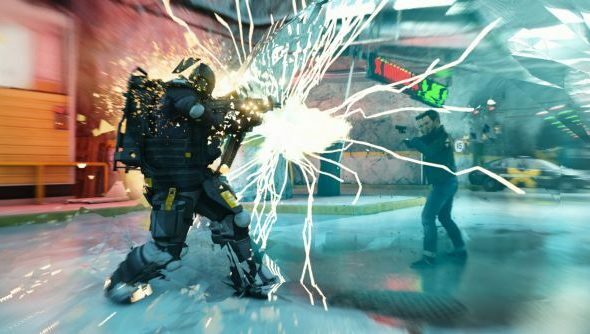 Now it’s out, will Quantum Break prove to be one of the best PC games of 2016? Meanwhile a few folks with extra-speedy internet connections have managed to get in and are posting thoughts, impressions and screenshots over in this NeoGAF thread. They haven’t noted any serious performance problems, but the graphical quality has come into question, particularly regarding the resolution things are being rendered at. Theory is, even at 1440p things are being upscaled rather than actually processed at that resolution, and it leaves much to be desired by players sitting closer to the screen. Also in that thread are pictures of the settings screen and all the options available, if you’re curious. We’ll have final judgement in our own port review in the next few hours, Fraser is already on the case. We would definitely recommend you hang tight until then to avoid another Arkham Knight situation. Original story:Quantum Break came out at midnight on consoles, but has had a short delay of a few hours to get onto PC. Hopefully all the port work isn’t taking place in that timeframe, as it will be out at 6am PST / 2pm BST, or a couple of hours from now, on the Windows 10 store. Those who pre-ordered the Xbox version that came with a free PC code may have to wait a little longer. By all accounts, the game is pretty good on Xbox One, but early word on the port isn’t looking good. Choppy framerates from an early stage on decent PCs, plus no way to exit other than an alt+F4. As with most games – particularly ones where no sites or reviewers have received code beforehand – we’d recommend you hold fire on buying until we can get our hands on it and bring you a port review. Similar to Arkham Knight, it’s a game where the latest generation is clearly being pushed to its max, and code optimisation is required for PCs to be able to handle it.